Canon PowerShot SD40 Digital Elph (known as Canon Digital IXUS i7 zoom in Europe and Asia) is the successor and upgrade to ultra-compact 5-megapixel Canon PowerShot SD30 or Digital IXUS i zoom digital camera. Canon PowerShot SD40 Digital ELPH and Canon Digital IXUS i7 zoom features 7.1 megapixel CCD, 1.8-inch LCD display, 2.4x optical zoom and Canon’s new DIGIC III processor with Noise Reduction Technology and Face Detection AF/AE. Other specifications include 9-point AiAF, single point AF, Face-priority AF, extra telephoto reach with Safety Zoom which allows greater zoom capability with smaller size photos, 17 shooting modes including Special Scene modes and movies capturing, ISO sensitivity of up to 1600, My Colors photo effects, Intelligent Orientation Sensor automatically rotate vertically shot images or movies (VGA at 30fps and QVGA up to 60fps) for playback at TV, LCD or PC, My Category image management and using SD flash card with SDHC support. The slim digital camera comes with 4 colors – Noble Blue, Twilight Sepia, Precious Rose, and Olive Gray, and weighs 3.7 ounces. Imaging Resource has an express review on Canon PowerShot SD40 Digital ELPH and concludes that the small and snazzy Canon SD40 is a digital camera that puts as much importance on style as it does on picture taking. And while it wouldn’t look out of place dangling from a wrist on a night out on the town, or on the fashion runway, for that matter this model’s 7 megapixel imaging chip and a host of new features such as Canon’s speedy DIGIC III processor and helpful Face Detection AF/AE technology are designed to produce quality photos. In most basic shooting situations it does just that. Dim the lights and turn off the flash, though, and the SD40 struggles, despite being able to shoot at light sensitivities as high as ISO 1,600. In short, the SD40’s noise issues are its Achilles’ heel, especially considering that stylecams are very often used in low-light settings. Those who want to shoot nightlife with greater quality while maintaining a sense of style would do better with the Canon SD700 IS or SD 800 IS, whose optical image stabilization delivers far greater image quality, and allows you to shoot at lower ISO settings. Cameras.co.uk reviews Canon IXUS i7 Zoom and concludes with total score of 81% that the Canon IXUS i7 zoom is very difficult to judge. In my opinion the picture quality does not match up to that produced by other more standard Canon digital cameras. If you would like a camera looks different to all the rest and will draw admiring glances from others then this is one of the very few digital cameras capable of achieving that. 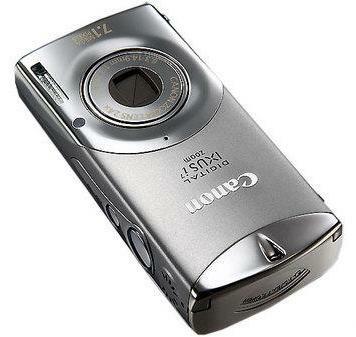 Nonetheless, Canon IXUS i7 zoom is a truly stylish digital camera. It is one of the few digital cameras to stand out on its own in terms of looks. It is available in four sharp colours. Picture quality is good and it makes a refreshing change to see a camera that stands out from the crowd. For more features, specifications, firmware updates and sample images, visit Canon PowerShot SD40 Digital ELPH official homepage (no longer available) or Canon Digital IXUS i7 zoom official homepage.